Time and time again we tell ourselves that the best designs are the simple ones. That the best services are the ones that are clear concise, simple and direct to the point. Often in our goals to make things simple and easy to use we will remove all the clutter. However sometimes we also remove all the little things that can make a design shine. That special attention to details that tells you the designer cares about the product or service in question. Well on Christmas eve 2010 I was reminded of this in two surprising ways. Both of these reminders came in the form of parcels. The first was from Five Simple Steps and was Andy Clarke’s new HardBoiled Web Design Book, amazing book by the way. But it’s not the book that took my eye (at first) it was the packaging for the book. Instead of just using a normal cardboard box or padded bag there was something a little different. 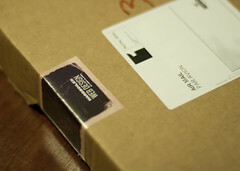 Mark Boulton and crew at Five Simple Steps used a box with a simple wrapper. Not just any wrapper, one in the same design theme as the book. This made the delivery of this book special, unique, an event. It’s amazing how just this little attention to detail, made me really look forward to seeing what was inside. In a way just this simple addition of a printed piece of paper enhanced the experience. The other package was a simple express postpack. However in this case it was the contents that were important. 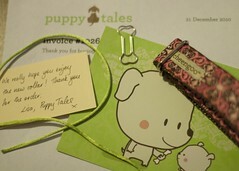 It was an order of a dog collar from my friend Lisa’s wonderful online dog accessories shop – Puppy Tales. Yes the package contained the invoice, and the ordered dog collar. But it also contained a good deal more. There was a series of little items that showed a good deal of care, if not love. The collar was wrapped in a plain brown paper tied with a light green cord, with a very cute little note personally thanking us. Then there was a Puppy Tales postcard as well, all branded and in Puppy Tales green. Finally the finishing touch for me was the paper clip in the form of a dogs bone. This package was pure magic to unwrap. You know it really did put a broad smile on my face. This level of attention to detail, especially during a busy peroid like Christmas, is to be appluaded and celebrated. There is a lot we can learn from these two examples. In that it’s the little things, that only take a few seconds to do, that can have a lasting impression on people and promote that positive experience. We can carry this idea into all aspects of our business; from answering the phone to development and designing online services. All it takes is those few minutes longer to finish something off and make it something to remember. It’s true the detail is where the experience is, don’t forget that.